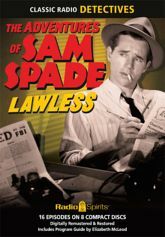 No bigger fad swept across postwar radio than that of the hard-boiled private detective -- and nobody had more fun with their wink-and-nudge take on the genre than the producers, writers, and cast of The Adventures of Sam Spade. Dashiell Hammett's legendary private eye had a sardonic sense of humor, which wavy-haired, rugged-voiced Howard Duff played to perfection. Produced and directed by William Spier, co-starring Lurene Tuttle, and featuring one episode with Stephen Dunne in the title role, we bring you sixteen capers with the greatest private detective of them all.